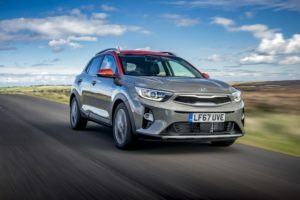 Kia has entered Europe’s fastest-growing market sector, that for small B-segment SUVs, with the Stonic, which it describes as an exciting, sporty, confident and smart new model. Diesel prices start at £17,795. The company says the B-SUV market in Europe is expected to double to more than two million a year by 2020, based on 2016 figures. Kia expects to sell 70,000 versions of Stonic in Europe in 2018, rising steadily to 100,000 a year. The UK will account for between 8,000 and 10,000 sales a year. Stonic is based on the latest Rio supermini and is powered by petrol and diesel powertrains from Rio and the cee’d family. It was designed in Europe at the company’s Frankfurt studios, with input from the main design centre at Namyang in Korea. Originally intended as a car solely for Europe, it will now also be sold in Korea, such was the reception it got when shown there. The Stonic is Kia’s first small SUV. Buyers are moving into B-SUVs from superminis, small MPVs and three-door compact hatchbacks. The Stonic is slightly longer than the Rio, at 4,140mm. It is also 70mm taller and rides 42mm higher from the ground to give it a clear SUV stance. While the two cars share some mechanical components, Stonic has a bespoke body and interior. Kia says key signature design elements such as the ‘tiger-nose’ main front grille, the distinctive C-pillar and the straight lines and smooth surfaces ensure that Stonic is instantly recognisable as a member of the modern Kia family. The First Edition version stands out thanks to its two-tone paintwork. The roof, wing mirror casings and rear spoiler are picked out in either black, lime green, red or orange, depending on the choice of main body colour, and there are colour accents in the interior on the seats and around the lower centre console and display screen areas. The First Edition also has Blind Spot Detection with Rear Cross Traffic Alert, to prevent the car from being driven into the path of a vehicle approaching from an angle out of the driver’s eye-line. 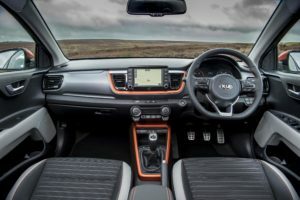 There is a 7.0-inch display with a DAB radio and MP3 compatibility in grade 2, and in the First Edition this is upgraded to a 7.0-inch touchscreen navigation and infotainment system featuring Kia Connected Services with TomTom. Android Auto and Apple CarPlay smartphone integration are standard across the range. All models have 17-inch alloy wheels, air conditioning, all-round electric windows with an automatic function on the driver’s side, roof rails, rear parking sensors, remote locking, electrically adjustable heated door mirrors, a 3.5-inch supervision cluster, Bluetooth with music streaming, automatic headlight control, bi-function projection headlamps and cornering lights and LED daytime running lights. There are body-coloured bumpers, door mirror casings and door handles, steering wheel-mounted audio controls, 60:40 split rear seats and a six-speaker audio system. The diesel option is the 108bhp 1.6-litre CRDi turbodiesel from the cee’d range. ISG, Kia’s engine stop/start system to ensure no fuel is wasted and no emissions are pumped into the air when the car is stationary, is standard. All versions are paired with a six-speed manual transmission and are front-wheel drive. The fuel economy champion of the Stonic range is the diesel, which has a combined economy figure of 67.3mpg with CO2emissions of 109g/km. There is 192 ft lb of torque stretching from 1,500 to 2,750rpm which produces 10.9-second acceleration from 0 to 60mph. 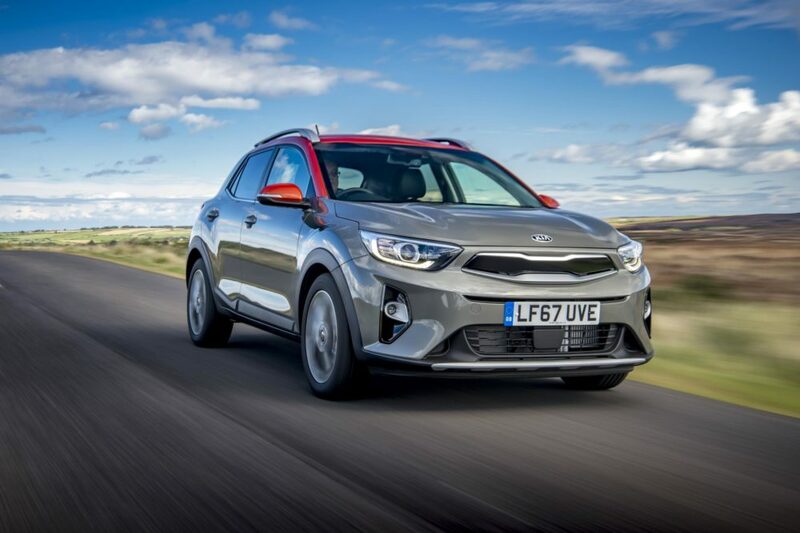 The Stonic relies on a similar suspension system to the Rio, with independent MacPherson struts at the front and a torsion beam axle at the rear, but Kia says there has been extensive retuning to take into account the SUV’s higher ground clearance and centre of gravity. In common with all Kias, the Stonic has a seven-year/100,000-mile warranty covering all labour and parts except those subject to normal wear and tear. The warranty is transferable if the car is sold before the time/mileage limit expires.